A cherished custom and one of the wedding reception's most emotional moments, the wedding toast is a memory in the making! 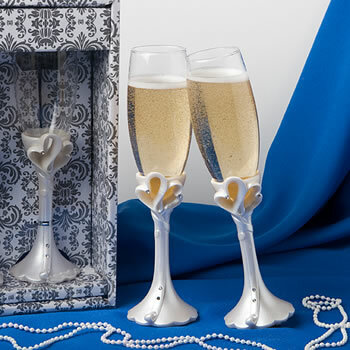 And these modern interlocking hearts toasting flutes make a stylish statement while providing you with a lasting keepsake that can even be passed on as a new family tradition. Perfect as accessories for a heart themed wedding or to add elegance to any wedding celebration, each interlocking hearts design toasting flute, from Fashioncraft's Finishing Touches Collection of wedding accessories measures 9 .5" high with a 2 .5" base and has a white poly resin detailed/carved interlocking open hearts design base supporting a classic 8 ounce flute shaped glass. Each pair of flutes comes delightfully packaged in a clear topped box with a slate gray and white damask design base for storage after your wedding day is through. Fast shipping beautiful Toasting flutes I recommend this company thank you.